The sailing vessel (s/v) Sionna is a 1963 Triangle 32. Rumor has it that she was designed by a group of sailing enthusiasts who wished – we assume – to make her the “perfect boat for all purposes.” A worthy cause, if patently impossible! That said, she does combine a long list of characteristics that make her unique, and give her a flavor all her own. There were about 50 Triangle 32’s made. The hull was manufactured by Grampian Marine in Oakville Ontario, Canada, then finished by Triangle Marine in Rochester, NY, USA. Credit for the design goes to Charles Angle, who also owned Triangle Marine. Her basic design is a Center-cockpit ketch, and full specs can be found at Triangle 32. Among her unique features are her double tandem (fore-and-aft on the centerline) centerboards, giving her a very shallow water draft of 3.5 feet, which deepens to 6.5 feet with the main centerboard full extended. Her air-draft (height from the water to the tip of her mainmast) is only 40 2/3 feet, which means that bridge clearance on the Atlantic intracoastal waterway (“The Ditch”) is unlikely to be a problem. Sionna is a full-keel boat with a cutaway forefoot and attached rudder. This design usually (though not always!) protects the propeller from the occasional lobster trap line, and makes a soft grounding (common on the ICW) a non-event, as no damage is likely. Her steering system is hydraulic, somewhat unusual for a boat of her size. The wheel is mounted at the aft end of the cockpit is what is known as a “Schooner steering” arrangement. This means that the wheel is behind you as you steer, unless you choose to sit straddling the steering box with the shaft between your legs. It feels awkward at first, but you quickly get used to it. Her engine room is vast for a boat of only 32′ LOD (Length On Deck), giving excellent access to engine, transmission, and services. It’s also where we store dock lines, spare parts, filters, oils, and our two folding bicycles. The installed engine is a Yanmar 3gm30, a 3-cylinder diesel producing 24 horsepower. Her aft cabin is reachable via a separate hatch aft, and was originally configured with two single berths, one along each side. We’ve modified this setup to create a larger, thwartships double berth, as the crew prefers to sleep together whenever possible. At 12,500 pounds (empty), Sionna is no lightweight, however her shallow draft and limited ballast (3000# of lead blocks secured in the bilge) limit the amount of sail area she can handle to some degree. Her rig is short compared to many boats of similar size and displacement,and therefore her performance in light air can be – shall we say – underwhelming. After sailing her for the 2015 season, one of our first purchases to prepare for long-term cruising was a 300 sq/ft “drifter” sail to augment her light air performance. Genoa – 125% (~230sq/ft) on a roller furler at the bowsprit. This is our main headsail. New in 2006, rebuilt and restitched for this cruise. Stays’l – 50%? 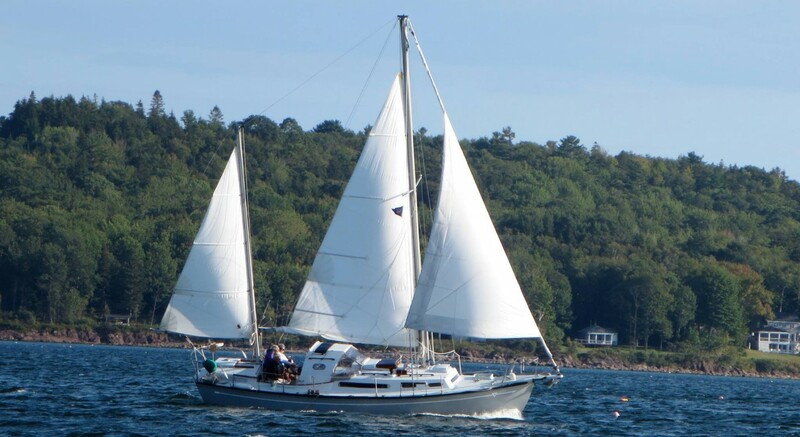 (~93sq/ft) Small, hanked on “Yankee”(high above the deck) cut sail, set on a removable Solent stay from the bow fitting. Primarily useful for heavier winds of 20-35kts when the Genoa is too much. The entire stay – with the bagged stays’l hanked on – can be stowed along the port shrouds when not in use and be rigged and flying in just a few minutes. Drifter – 159% (~297sq/ft), rigged to be set flying (attached only at the corners) from the bow fitting and the spinnaker halyard. This is a light-air sail made of 2.5oz. dacron fabric. New to us, so we’ll be experimenting with it to learn it’s likes and dislikes. Storm canvass: No one likes to talk about it, but it’s really a good idea to have available, even if you never use it. Storm Trysail – 58sq/ft . We’ve never attempted to set this sail, something we intend to remedy before setting off for what is – admittedly – hurricane country. Intended for conditions we’d like to avoid; winds 35-50knots. Storm jib – About 55sq/ft. Like the storm trys’l, it’s intended for winds approaching 50knots. Rigged to fly on the solent stay in place of the stays’l. Main (or “bower”) – 35# CQR “plow” type, attached to 75′ of 3/8″ chain, then 200′ of 5/8″ 3-strand nylon line. You could literally suspend the entire vessel on this line. This anchor is always rigged and ready to run from the bow roller. Secondary – 20# Danforth “lightweight”, attached to 30′ of 5/16″ chain, then 50′ of 5/8″ line, then 10′ of 3/8″ chain, then 180′ of 5/8″ nylon. Complicated, but quite effective at keeping the anchor lying on the bottom, where it belongs. Storm anchor – 35# foldable Fisherman style – this has the classic anchor “shape”, and is said to be effective in unusual conditions – like rock or grass. We’ve yet to need it, but carry it below, folded, against the day we do. Spare anchor – 25# CQR plow. One never knows when they might loose an anchor, and not having one isn’t an option, so we’ll be packing this spare in somewhere, just in case. Spare rodes – we have several lengths of 5/8″ and 3/4″ line aboard in 150-250′ lengths. Again, you just never know. Built-in propane system and galley range with two burners, oven and broiler. Ok, yes, we’re foodies. “Airhead” Composting toilet – this was already installed, actually, but we love it. No pump-outs!